A book to keep while traveling around France, a tufted headboard to complete your bedroom decor and more . . . Looking for inspiration? Seeking inspiration to give as a gift to someone starting a new journey? This may just be the book you’ve been looking for. Jessica Bacal interviews 25 successful women, including best selling authors, a Stanford professor and more, as they share how making mistakes and learning from them paved the way to their success. Take a tour around France with author Alexander Lobrano’s new book Hungry for France. With each chapter diving into a different region of France, from Provence to Normandy, readers receive tips on the off-the-beaten path best restaurants, wineries, food producers and inns. Certainly a resource to have on hand when planning your next trip. Looking for a classic, yet unique retro coffee table that will pull the entire living room together? Well, West Elm has you covered with their Reeve mid-century piece. With its long oval design, this coffee table will be well-proportioned next to your signature sofa. 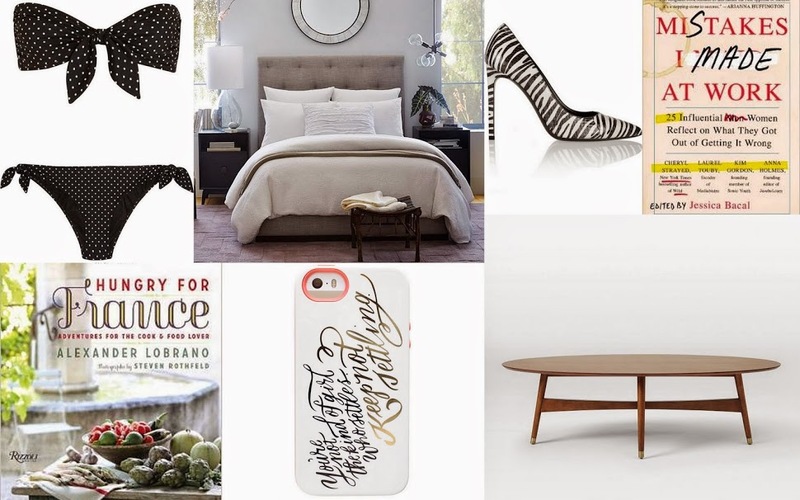 Looking to add a touch of texture to your bedroom without breaking the bank? West Elm has just reduced a handful of colors in their Diamond Tufted headboard design. Something about this “Keep Not Settling” phone case caught my eye. The reason is probably self-explanatory, but sometimes you have to remind yourself to stay the course and know your worth. A simple reminder that will be with us everyday. Designed by food blogger Joy the Baker, it’s a simple accessory that makes a big statement. Oh, designer clothing at generously marked down prices. I always have to at least take a look when the new items hit the semi-annual Net-a-Porter sale, and then I found these two items. A classic, yet tres chic black and white polka dot bikini and statement Saint Laurent pumps at a wonderful price.